A chance for people travelling over to Perth to MokeFest 2013 to share from where and when they are leaving, what their rough plan is for getting there and getitng back for people to organise themselves to travel in the safety and comfort of numbers. A trip is just a drive unless it is shared. Leaving Friday and travelling with Woody and Smokey across to Port Augusta via Dubbo to join up with the rest of group for the trip west. After MokeFest I will be heaidng south with Woody, Smokey and who ever else and coming home via the south coast of WA. 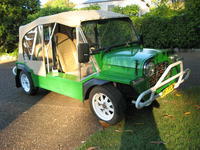 Craig is taking his young Daughter and Son for a drive across to Perth in his bosses Moke. Meeting up with the group leaving Melbourne on the Saturday morning, Craig and family will be getting their first real drive in a Moke and it will be a pretty big first drive all the way to Perth. They will be with us until MokeFest in before they fly home and his boss, Graeme and his mate Jim will drive the Moke home with via the ABH. We're leaving Melbourne on Saturday morning 14th September, preferably with any convoy going. Looking to stay in motels, roadhouses etc. Trekking through the desert at night armed with a trowel, a lighted match and sheet of newspaper somehow lost its charm. Coming back we might travel via Margaret River etc but no firm plans other than driving back. Looking forward to meeting all the Tourists in Port Augusta. Sabrina and I will be leaving Saturday the 14th heading down to Tumut, to say goodbye to my other daughter Katherine who a few meet at Dungog. Then heading to Wagga and first night Hay hopefully meating up with Biggles, Mazy and who ever else has tagged on to the group. Next night in Port Augusta to hopefully to give it a day to make sure the Moke is good for the big jump to Perth. Looking forward to the adventure.